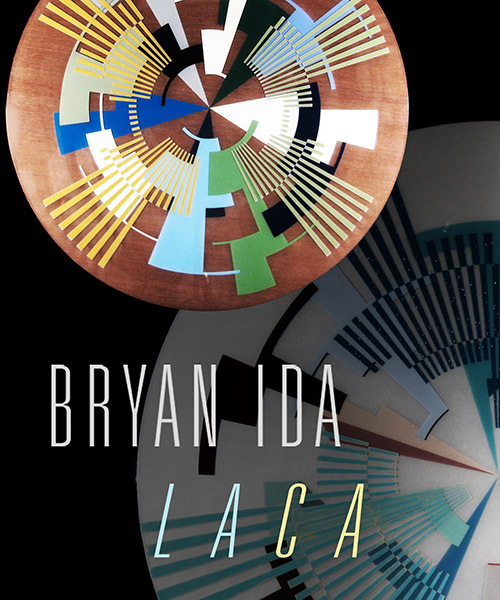 Bryan Ida’s “LACA” is the second artists’ installation series at BlueWhale. In my latest series I wanted to capture the feelings of location and identity with an emphasis on the unique architectural history of Southern California. I reflect the relationships formed within the region between all its divergent cities and communities. I wanted to somehow express the complexity, diversity, and beauty of the region we live in as well as the sense of time that is felt as the city experiences its decay. The rectangles are more traditional landscapes with a view from the horizontal perspective where one can see a horizon line and the outlines and forms of buildings that identify a city. The foreground composition consists of colors and forms inspired by short glances, impressions, and photographs of architecture in the Southern California area. I try to contrast the idea of a fleeting unbalanced glance with the balance achieved in stasis. I use negative space behind the forms to tell as much of the story as possible. The use of negative space for me is about finding a place to fit in; the relationship between what is there and what is not. It speaks of location. The composition is a balance between the negative space in the back and the forms and outlines in the foreground. To complement these compositions, I’ve developed a technique that layers paint inside thick layers of epoxy, essentially isolating each layer from one another. This physical separation gives a sense of depth, volume and detachment again echoing the city theme. This entry was posted on April 9, 2013 by bryanida. It was filed under Uncategorized .